Volume 1, Number 1 of the first independent student newspaper on the CSUSM campus. The cover story, A New Frontier, discusses the Italianate style of the campus architecture. CSUSM President Bill Stacy is featured in an interview with the Pioneer editor Larry Boisjolie. Please note: Because of their size, some of the newspaper files may take time to load into the image viewer. These files may be downloaded to your personal device for off-line reading provided all copyrights are observed. 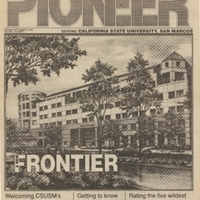 September 4, 1990,” University Archives at the CSUSM Library, accessed April 18, 2019, https://archives.csusm.edu/student-newspapers/record/7.